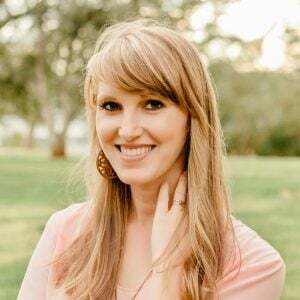 One time in college my best friend Sarah taught a session at a church activity. It was called “How to Make an Impressive Dinner,” and we made it all, from main dish to sides to dessert. A bunch of 19 and 20 year old girls cooking fancy food in a run down apartment in Provo, Utah. Good times. She made homemade rolls and I thought it was the most amazing thing ever (or dare I say, impressive). I didn’t know making yeasty bread was a thing you could actually DO. My mom never baked anything with yeast. I think she was just always too offended by the “knead for 8 minutes” part. So there you have it guys. If this recipe has too much kneading for you, follow Mom’s instructions above. 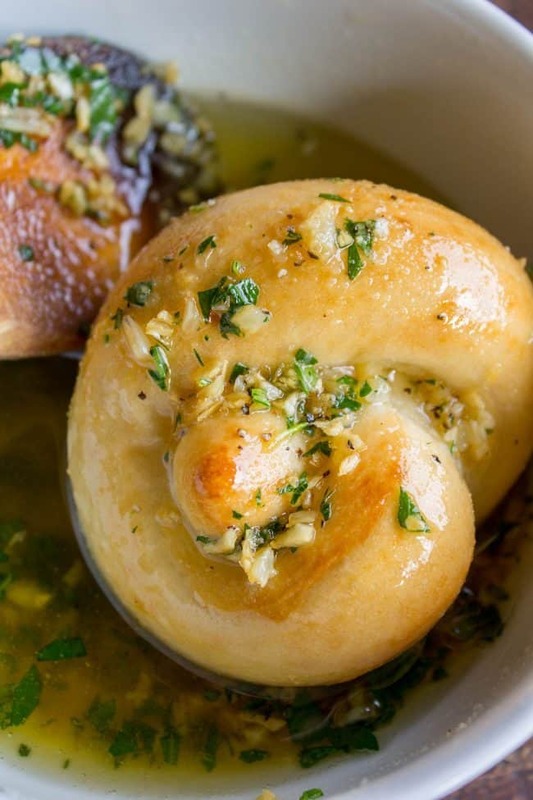 How can you say no to a chewy, fresh baked roll that has just been dunked in garlicky butter and olive oil? You can’t, really. These would be great to make ahead for Thanksgiving. You could make them today and freeze them. * Fresh bread is one of the best parts of Thanksgiving! 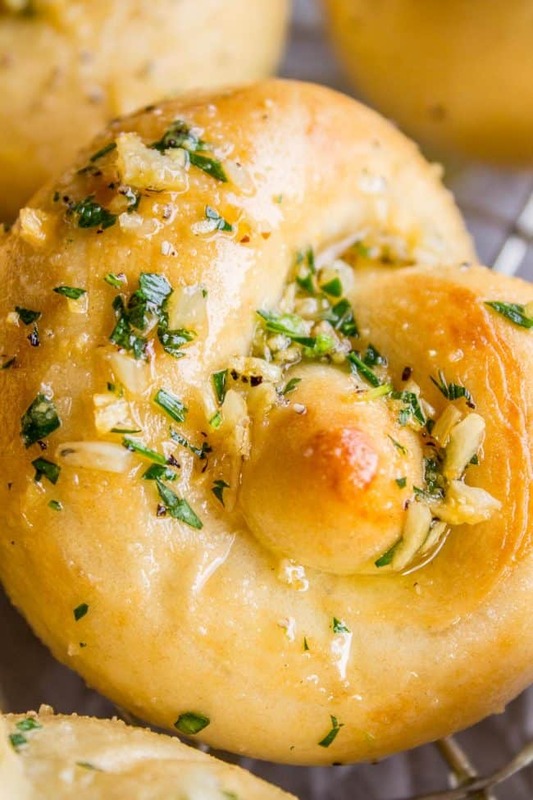 These Garlic Knots are the perfect rolls for your Thanksgiving (or Easter) table! 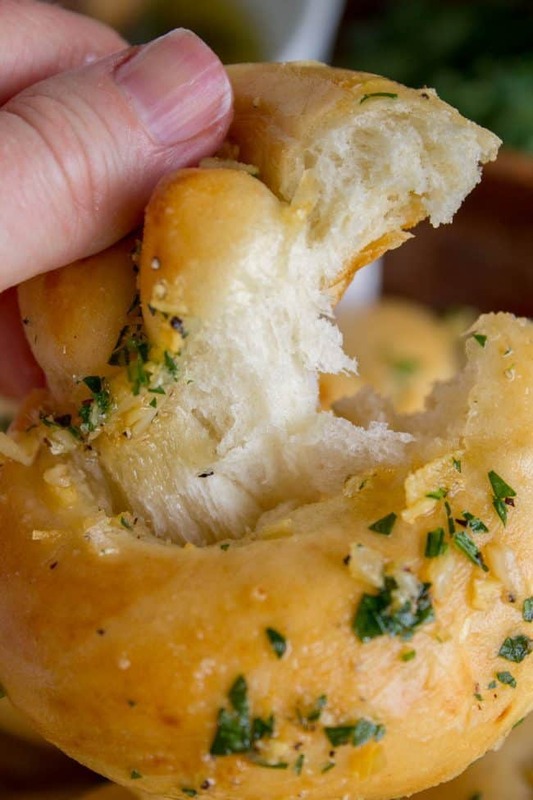 They are chewy and soft, and have TONS of garlicky, buttery flavor! You can't eat just one. In a large bowl or stand mixer, add the yeast, warm water and sugar. Make sure the water isn't too hot. It should feel like nice bath water. Not hot-tub hot. Let this mixture sit for 5 minutes to proof. You are "proving" that the yeast hasn't been killed. If the yeast has puffed up, you're good to go. If the water is still flat after 5 minutes, then toss it out and start over. Stir in the salt, olive oil, and 1 cup of flour. Switch to the dough hook if you're using a mixer. Stir in another 1 and 1/2 cups flour. Knead for 7-8 minutes. Add the remaining 1/2 cup of flour a few tablespoons at a time if the dough is sticking to the sides and bottom. You want the dough to be smooth and elastic. It should not stick (much) to your fingers. Stop adding flour when you have reached this stage. 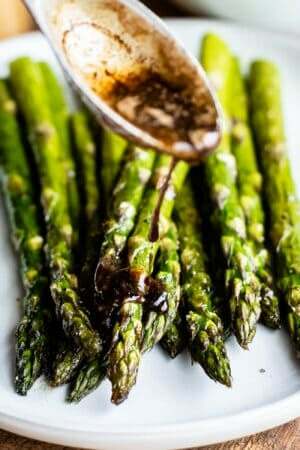 Grease a large bowl with nonstick spray or rub with olive oil. 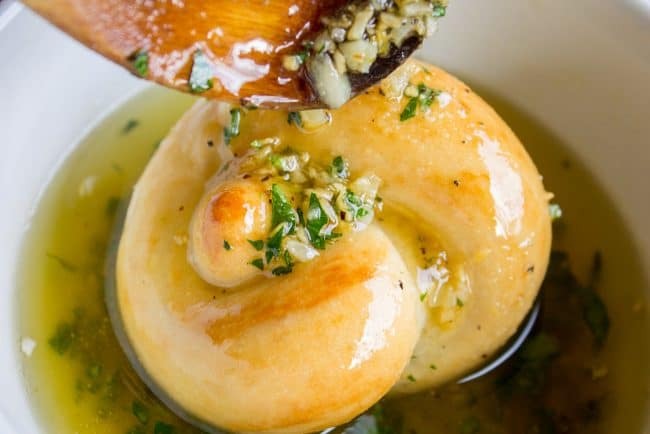 Shape the dough into a ball and place it in the greased bowl. Turn it over so that the top half gets oiled. Cover with a tea towel and let rise in a warm place for about 1 and 1/2 hours, or until doubled in size. I like to let dough rise in the oven: before you put the dough in, turn the oven on to the warm setting for a couple minutes, then turn the oven off. Once the oven is off, you can put the dough inside for a good rising environment. Once the dough is risen, punch down and let rest another 10 minutes. Prepare 2 baking sheets with parchment paper, or spray with nonstick spray. Divide the dough into 12 equal pieces. I weighed mine, they were each a little less than 2 ounces. Roll each piece into an 8-inch snake. It should be between 1/2 and 1 inch thick. Carefully tie each rolled-out piece into a knot. Place each knot on the prepared baking sheets. Cover with tea towels and let rise for 45 minutes to 1 hour, until doubled in size. 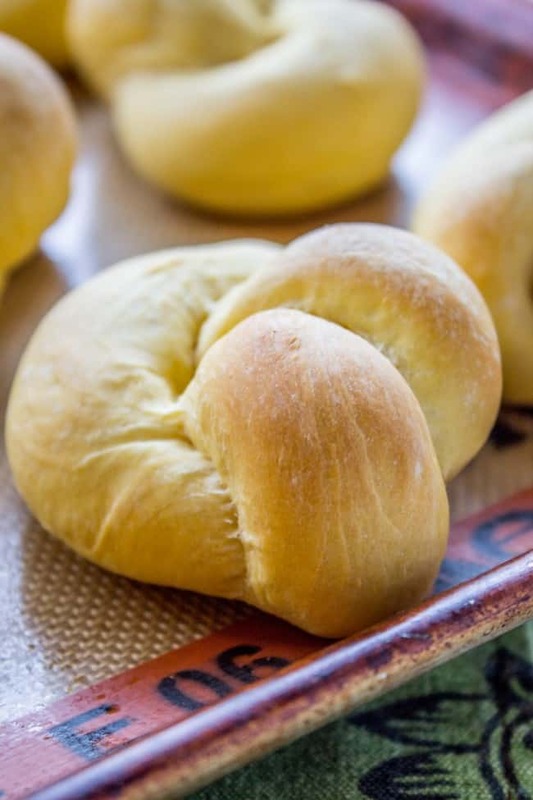 Bake the rolls for 20-25 minutes, until the tops are golden and the bottoms are brown. I used 2 oven racks and switched pans halfway through baking time. Remove from the oven and let the rolls cool on a wire rack for 10 minutes. While the rolls are baking, make the garlic butter sauce. In a small saucepan, add butter, olive oil, garlic, salt, and pepper. Cook over low heat for about 3-5 minutes, until the garlic has just barely started to brown. Keep an eye on it, you don't want the garlic to get dark. Remove from heat and stir in the parsley. Let cool slightly. Dip each roll in the garlic butter sauce. It helps to spoon some on top to make sure you get garlic in the knot crevices. Place on a wire rack. Serve warm. This recipe only makes 12 rolls! It's not enough! I will double it next time. *If I were going to freeze these, I would skip making the garlic butter sauce. 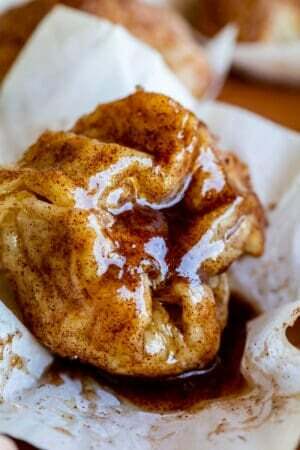 Freeze the rolls in a ziplock after cooling from the oven. To thaw, leave rolls on the counter, sealed in the bag, for a couple hours. Reheat in the oven on a baking sheet for 5-10 minutes at 350. Then continue with the dipping in step 17. This recipe is from my BFF Sarah's mom, Anne. Thanks Anne! More yeasty bread! Give me all the bread! 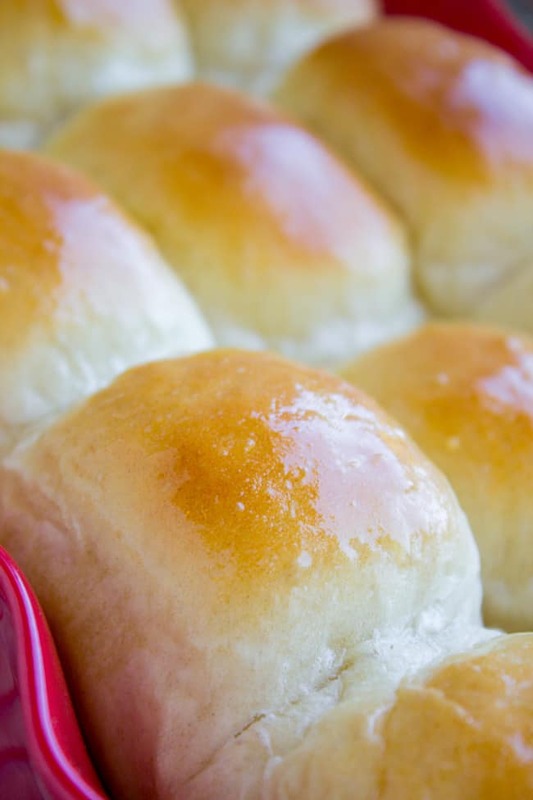 Buttery Sweet Potato Rolls << these would be perfect for Thanksgiving too! 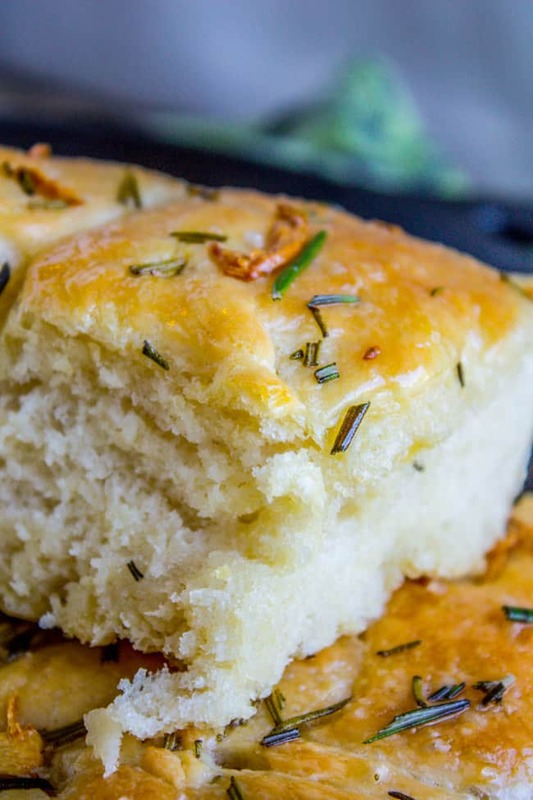 Garlic and Rosemary Skillet Bread < can there ever be too many garlic bread recipes? No, no there cannot. 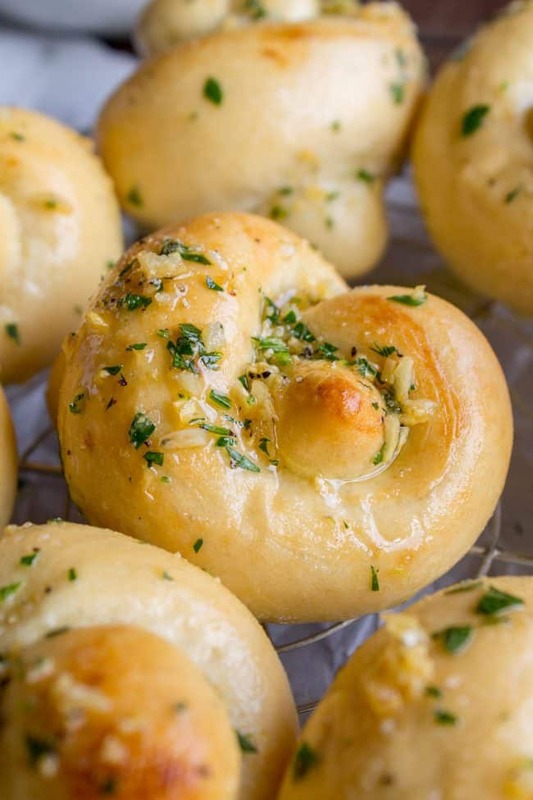 More garlicky rolls from blog friends! 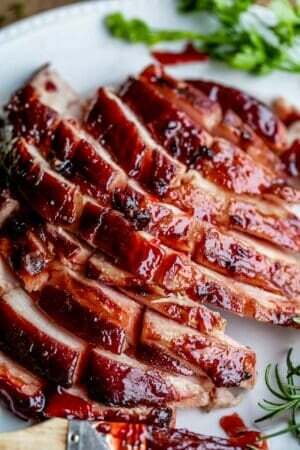 Awesome recipe and perfect ingredients! Thanks for sharing this recipe that is not only great for thanksgiving celebration but is also good for ordinary days or meals. The savory flavors of garlic, butter and butter make it a great snack for ordinary movie time, snack time or study time. 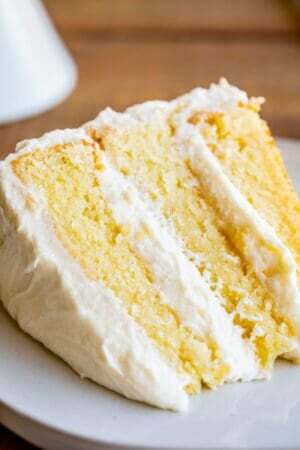 It is also filled with richness and flavor so we will surely eat more than one until we get contented with its unique taste due to its unique blend of ingredients. I can’t wait for tomorrow to try this at home! Thanks Billy! I’m glad you loved the recipe! Super excited about making these for Thanksgiving. Karen. You are right that one recipe is not enough. I made a batch of your Aunt Shirley’s dinner rolls a couple days ago and Chip and I have eaten the entire batch. No now I have to decide which one to make??? I was considering making the Aunt Shirley rolls and putting the garlic butter on them! I don’t know what to do?!!?? I’m on the horns of a dilemma!! Help!! Ooooooh Aunt Shirley garlic knot mashup??? That sounds amazing!!! These look so good! So funny that Jan won’t do yeast. It’s always funny to me how people can be raised by the same people but be so different in ways. I was raised by a woman who wouldn’t know yeast if it rose up and bit her :) Your mom absorbed special powers from somewhere – maybe Grandma Alma? I don’t know if Grandma Doris did yeast – your mom also has the memory gene, you’ll have to ask her…. hi can the dough be made a day earlier and refrigerated or frozen? I hope you enjoy the recipe Nicoletta! Thanks for your comment!